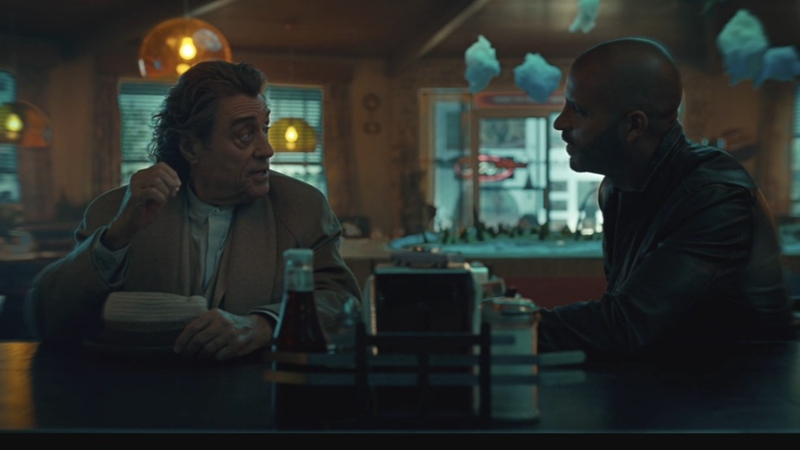 Apr 1 TV Recap: American Gods: Season 2, Episode 4 "The Greatest Story Ever Told"
For the second week in a row this season, American Godsstarted off with its best foot forward. In the case of The “Greatest Story Ever Told”, that foot was an absorbing, bittersweet one centering a character we’re initially unfamiliar with. We see a young boy playing ‘Pong’ before his father turns his attention to the piano. The boy plays classical compositions beloved by his father with reasonable skill as the metronome ticks, but we see–through intercut sequences of him gaming and coding set to rock songs–that his true interests lie elsewhere. As the son grows older, he tries to reconcile his father’s expectations with his own passions by translating Bach pieces into a database making electronic compositions of its own. Before we can be certain of the father’s satisfaction with his son’s output, we cut to the father’s funeral. It’s a gripping, sad story even before we’re aware of what it has to do with anything else in the show. But soon enough, that becomes clearer when we see Technical Boy make his pixelated appearance into the picture. This episode was one mourning lost potential—even for the show’s most sneering, unlikeable character. We find out the boy from the beginning is an old follower of TB—per the latter’s word, he was the boy’s only friend to speak of. Their reunion almost seems pleasant and constructive at first. But despite a last-ditch effort to prove his worth to the New Gods after Argus’ untimely demise, TB ends up rejected by his old friend and “retired” at Mr. World’s hands. If this is the last we see of TB, I can’t say I’ll miss his presence or that I mourn for him, but it’s surprisingly easy to yearn for who he could have been through better life choices. By embracing a cynical, hateful (and lest we forget, hate crime enabling) lifestyle through his allegiance to the New Gods, constructive relationships and long-lasting friendships seemed out of TB’s reach. The way he begrudgingly laughs at an ominous but weirdly upbeat, emoji-laden series of texts from New Media, before reverting to an unsurprising “I hate you so much” speaks volumes. What a waste. It’s enough to make you hope that Shadow, who suffered at TB’s hands early on last season, can avoid similarly fanatical devotion to the Old Gods. If it’s not quite emotionally abusive at this point, Shadow’s relationship with Wednesday certainly seems uncomfortably manipulative at times. During a key scene this week, Wednesday lays bare why he picked Shadow for his mission—he needed someone with no emotional attachments or significance to anyone around him. In the wake of Laura’s death, Wednesday is shameless in telling Shadow, “You literally mean nothing to any living person, or any dead one either as far as I know.” Wednesday knew Shadow’s grief and confusion would give him the desperation needed to commit to this cause—first an intriguing adventure, but now an all-out holy war. However amusing a presence McShane continues to be, it’s worth noting that said charisma is exactly what makes Wednesday so potentially dangerous—his talkative charm as powerful in its own way as World’s whispering menace. This episode reveals American Godsas a show seemingly questioning its own racial politics, an interrogation continued by Mr. Nancy in a later scene at the funeral home. In what admittedly seems like a Hail Mary pass for Orlando Jones to reclaim his scene-stealing magic from Season 1, Jones nonetheless manages that in a monologue declaring peace as a “beautiful” but ineffective idea. He goes on to call slavery a “cult” that got a rebrand alongside the so-called alt-right, with modern “plantation owners” coming in the form of those who enable a school-to-prison pipeline, contaminated water and police brutality to endanger people of color’s lives. And while Nancy acknowledges that war between the gods is now underway, it was fueled by the death of a white woman (Zorya, killed in the Season 2 premiere’s climactic attack)—Wednesday and Czernobog might not be so quick to jump into action for the death of a black woman, like the one Ibis is operating on during this very conversation. This even puts the highly questionable fried chicken scene I bemoaned a few weeks ago in a different light—Shadow now seems like far from the only Old God ally with reason to doubt Wednesday’s intentions. Bilquis ends up being a peacekeeper here, attempting to calm Nancy’s righteous anger with her observation that “suffering is not sacred.” It’s a relief to see that she now seems unlikely to side with the New Gods for the sake of a plot twist—even if she ends up proving Nancy’s point when she says Zorya’s death is what kept her from switching sides. Like Shadow, Bilquis seems conflicted about the role she’s playing—though during a discussion with a visitor to the funeral parlor, it’s her godhood that seems most in question. Perhaps my enthusiasm for this episode (all in all a beautifully helmed, emotionally affecting hour) is due in part to Bilquis being treated much better this season than Sweeney, Salim and Jinn (all of whom were MIA this week). But credit must also be given to some Season 2 newcomers. Mama-Ji (Sakina Jaffrey) has been an intriguing presence ever since that fateful carousel ride during the premiere, and “The Greatest Story Ever Told” is a step in the right direction toward worthwhile material for her. As Mama-Ji dons a waitress uniform and pours coffee for Shadow and Wednesday, we find out she’s at every Motel America location, and she and her followers own more than half of all motels in the U.S. Wednesday may long for her to return to the battlefield, recalling the time she slew Raktabija, but her intuition is to warn Shadow of his master, “he will be the death of you.” If nothing else, she too is healthily suspicious of Wednesday’s cause and won’t submit to simple flattery so easily. One would hope Mama-Ji continues to build toward more of a morally complex character than just an interesting backstory—I found Jaffrey to be an invaluable character actor during appearances on House of Cards andMr. Robot, and hope her best is yet to come. But lest I bury the lede—American Gods is now a Deadwood reunion! After much talk of “Money” throughout the episode—Shadow mourning the loss of gold and silver after President Roosevelt abandoned the Gold Standard, Wednesday saying money “isn’t actually a piece of paper, it’s a story”—we meet them in two forms. “Money” first comes in the form of children selling candy to Shadow and Wednesday, pointing out the fomer’s lack of a debit or credit account and further invalidating his sense of identity. But they make a more amiable appearance as E.B Farnum himself—William Sanderson (billed in the credits as “The Bookkeeper”). As both Wednesday and World come before him in an attempt to get money’s undeniable influence on their side, The Bookkeeper makes it clear he’s not ready to “make emotional investments”—just to pay for his meal. And for all the frustrations that can come with this show, sometimes it’s just such great comfort food to see a murderer’s row of performers like Sanderson, Ian McShane and Crispin Glover making a meal of the scenery together. I can safely say that “The Greatest Story Ever Told”is the most at ease I’ve felt with this season so far—I just hope the character arcs we broke away from this week can pick up the slack when they return.